Sometimes we wait a long time for things to clear up. Day after day of undifferentiated gray eventually gives way to more definition in the clouds, a kind of coagulation of vapors with patches of blue in the background. 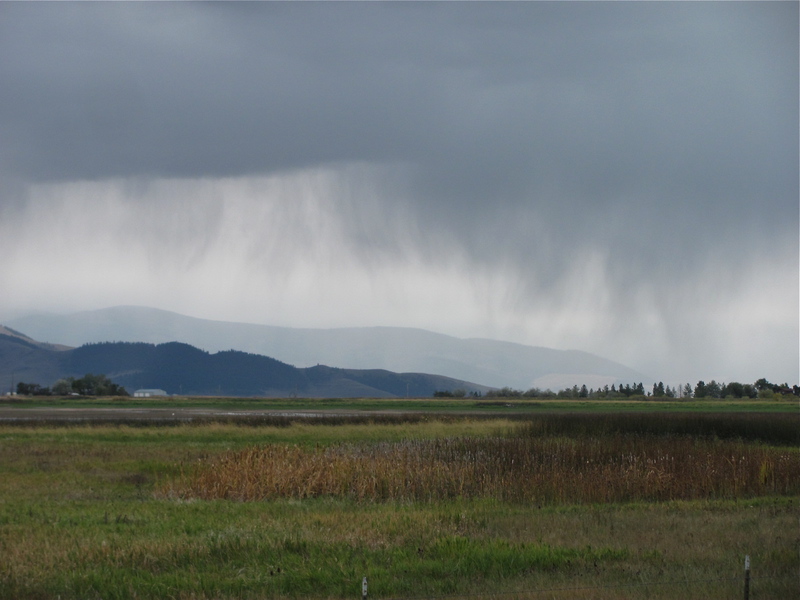 A change in the weather may be metaphor for clearings in other aspects of our lives. We can wait a long time before we are clear about vocation, avocation, and the line in between. One day, after muddling around in the options, we wake up and say to ourselves, I am more a person of this region of the earth than this one, more a person of the forest than the desert, more urban than rural. Or, after some confusion in the realm of relationships, causing pain in someone else’s life, or on the receiving end of such pain, we realize that one particular person is the true companion of our lives. And sometimes these things never come into focus; they remain blurry, obscure, and without clear margins, as the surgeons say. When things do become clear it feels like a gift, something that arrived in its own time from another world. Clearings lift the heart. The energy we spent feeling around in the dark suddenly becomes available for a deeper exploration of where we are and does not dissipate itself in all the half-hearted starts and stops of our confusion. 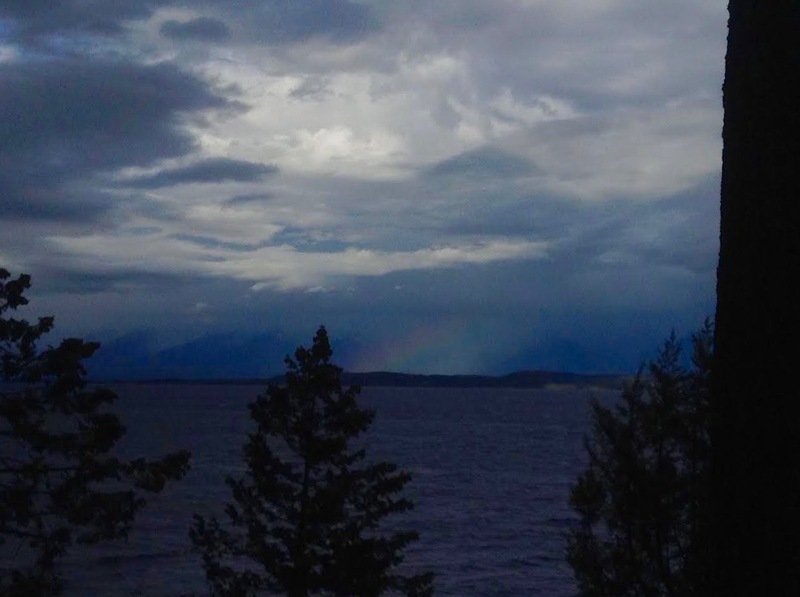 Though such clearing came at the end of our stay near Lakeside, it did eventually arrive. The clouds congealed over The Missions and the way, even if only the way home, became clear. In 2015, the plight of refugees fleeing Syria, Afghanistan and Iraq is on the mind of most people. Whatever our private thoughts or acts of charity, I cannot help but give thanks for various forms of shelter in my own life. In mid-September friends allow us to rent their cabin just south of Lakeside. From the deck we look north and see the flats of the Flathead River delta and Glacier Park’s peaks in the distance as well as waves breaking around Angel Point to the south. During a week of unremitting wind it never seems prudent to make the long, open-water crossing to Bigfork. Instead, I honor the pull toward Deep Bay in the south, a pull as sure as the one that causes cliff swallows to return each spring. As I paddle south I let memories of Deep Bay come to me. For at least twenty years Deep Bay has seemed like a sheltering place. My wife led retreats here for organizations and small groups. When we were remodeling our home we came to Deep Bay to recover from the effects of sheet rock dust, hammer drills, and concrete saws. This cliff-side perch with a deep green bay below has always seemed like a place to restore the mind to stillness. Recognizing the difficulties of maintaining this place and its original vision, we understand that Deep Bay Center is no longer available to the public and may be up for sale. Nevertheless, I feel pulled toward this deep notch between the cliffs and the quiet I have always found here. Whoever owns the land and timber-frame structures, Deep Bay will always seem inviting, like a place of safety and rest. So, I continue south past Angel Point, Hockaday Bay and Hughes Bay. I pass the reef on the northeast corner of the refuge and make a right turn into the quiet. In the pocket of the bay I wander among drift logs. 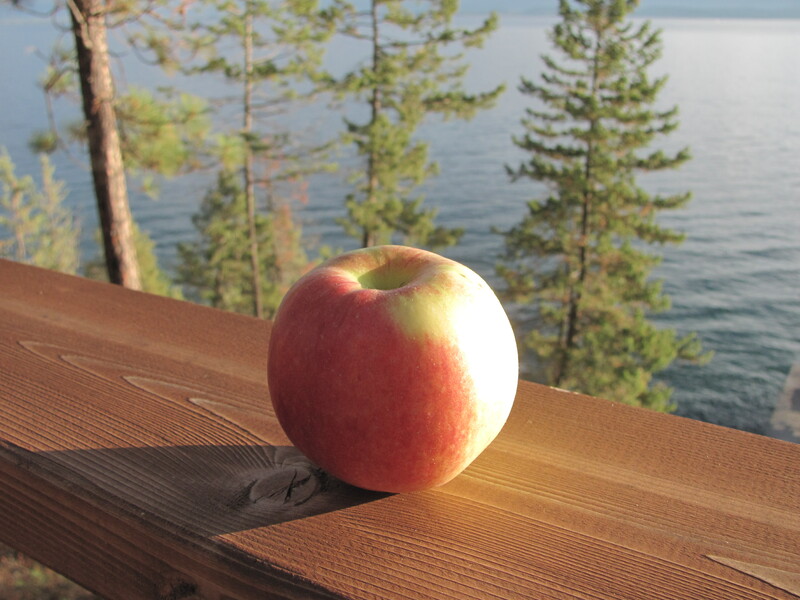 Continuing to wander, I find a perfect apple in the wild depth of the forest. There is no way to know if it sprung from a picnic’s tossed core or a bear’s secret deposit. Either way it shines bright against the gray light. Not equal to Augustine’s scruples, I reach up and pick the apple hoping to turn what might be considered theft into a present for someone else, my way of expiating the guilt and sharing a beautiful surprise. On the return paddle I slip the right blade under the bungee cord, lift the loop of my skirt and carefully extract my camera for a shot of the meditation center on the top of Angel Point, a structure I have always admired. After I come into the narrow slot between the dock and the cliff I think of lines I wrote long ago after my first encounter with Deep Bay. will lift their pointed wings. or the flat plate of the lake. they draw their unselfconscious arcs. that did not end in flight. In an earlier post (Clear at Last) I describe conditions on the lake that I could barely imagine in September, two months earlier. Smoke from the Sawtooth Fire in the Bitterroots to the south and smoke from the Mustang complex of fires spreading from Idaho, plus smoke from 140 square miles of fire in Washington State have poured into Montana and filled every valley. These conditions awaken a primal desire to be near water. With several years of history leading retreats at Deep Bay, we receive permission to rent a timber-frame house at the retreat center. This visit will give me an opportunity to paddle from Deep Bay to Woods Bay, a direct route across the lake, west to east. When I pull out of the deep pocket of the bay I lose sight of the bottom almost as soon as I pass between the black teeth that protrude out of the lake at the northeast corner of the bay. I don’t see the lake’s foundations again until I approach the armored point on the north side of Wood’s Bay. I am not only unable to see the lake bottom, I am unable to see the opposite shore. 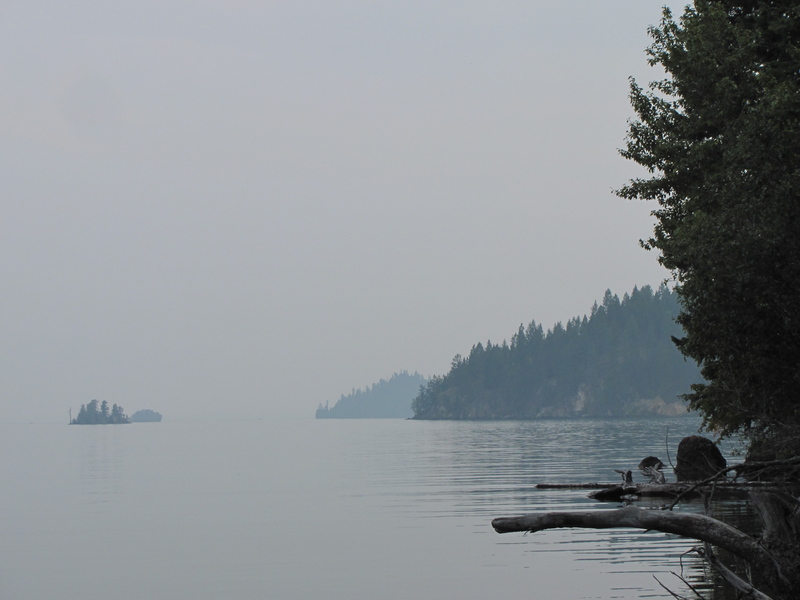 I was not alive in 1910 to see for myself, but I have read that the firestorm of 1910 filled the lake basin with so much smoke that some boats could not find their docks or ran aground, so poor was the visibility. As I begin the crossing I can hear a few boats on the lake but cannot see them. This feels disconcerting, if not dangerous. Almost an hour later, when I finally see a boat, it appears suspended in the air. There is almost no distinction between water that looks like liquid solder and air saturated with gray smoke. After more than an hour of blind paddling I detect a faint finger where the forested peninsula just north of Wood’s Bay seems to be drawn along the water line. I press on through the dense air, using dead-reckoning to help me navigate. I have almost no visible sense of progress. I paddle a thousand strokes but everything around me seems the same. This must be how it feels to a cancer patient trying to recover from the enervating effects of chemotherapy; how it feels to people trying to revitalize an institution in need of radical transformation; or, how anxious parents feel when young adult children flounder from part-time job to part-time job, looking for a footing on the continent of a more stable future. Today I paddle in faith that all these strokes will eventually lead to the opposite shore. Not being able to see into the distance, I focus on the near-at-hand. As I paddle I notice something I have never seen before: a series of narrow parallel lines peels off the bow of my boat and spreads in a widening “V.” As a boy I saw lines like these along the lower jaw of the blue whale in the Museum of Natural History where my father used to take me on my birthday. I wonder if there is a connection between these little lines streaming off the prow and the anatomy of the lower jaw of the great whales. Are the lines more than the pleats of a great expanding mouth, perhaps even an efficient way to channel the flow of water around a form that propels itself through water? In time I spot what looks like either a buoy or a small sailboat a half mile to the north of my course. The smoke makes it very difficult to identify anything with confidence. I shift my course slightly to the north so I can approach and see this object more clearly. I approach close enough to see that this is one of the two instruments that the Biological Station has anchored in the lake. Having made the identification, I readjust my course slightly back to the south. I am beginning to pick up details on the far shore–a roofline, a water tower on the hill, a glinting window. Stroke, thought, stroke. By now I want to get out of the boat, stretch my legs, eat the cookie I keep thinking about, get a drink of water. 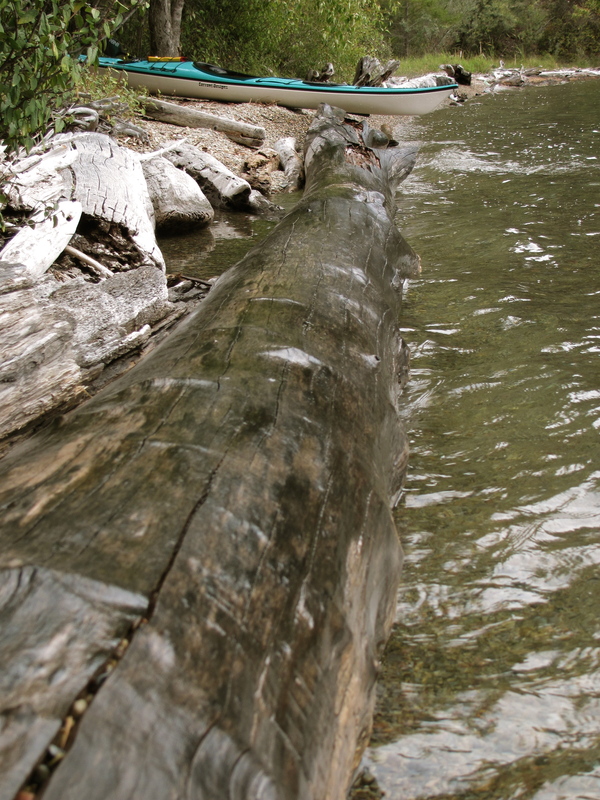 I find a tight little spot, a grove of cottonwoods, some drift logs, a shallow landing, and pull out. With my feet and part of Bluebird still in the water, I settle my rear end into the gravel, pull out my water bottle, take a long drink, and open the plastic bag protecting my now-late lunch. It feels good to settle myself into the red, tan, gray, and green stones, to feel the earth after making my way through water and opaque light. I pick up stones, examine their colors and shapes, look for fissures and lines, then put them back. Nearby, little white feathers from the ring-billed gulls drift in the bay. I drink in the water’s clarity, a clarity that seems strange when everything else is obscure. I stow my few items of gear, slide my boat back into the water, and look back over my shoulder. A vague depression, a footprint, is the only evidence of my presence. I paddle out of the bay, slide past the breakwater, take one last look at the green cobbles on the bottom, knowing I won’t see the lake bottom for nearly two hours, and head into open water. This time I aim for the barely visible buoy to the northwest. In the smoky air it is again hard to have a sense of progress. I look away from the buoy so as to not feel discouraged. I have no landmarks to the left or right against which to gauge my advance. Finally, I see the anemometer on the top of the device, the yellow ring of the float, three solar panels, and a sign warning about potential shock hazard for those who disturb the equipment. I drift in and take a few photos. 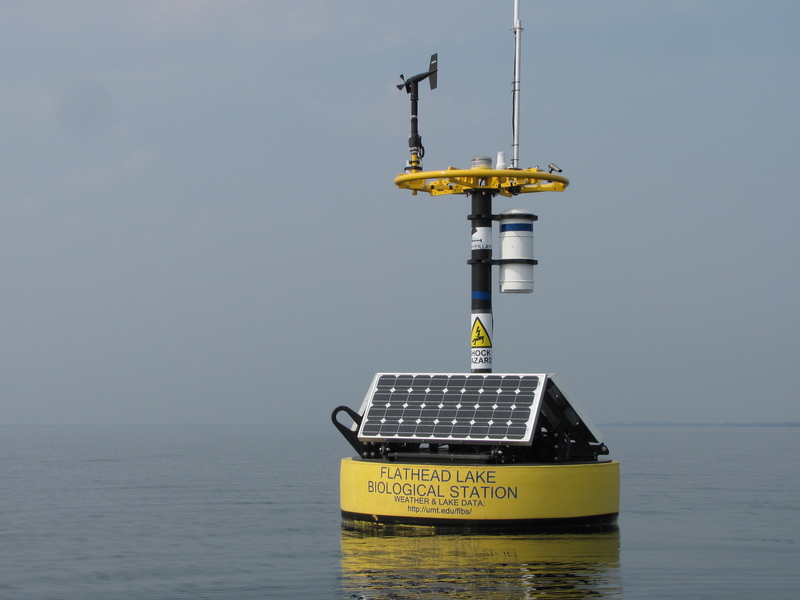 This instrument, one of two anchored in the lake and coupled with land-based meteorological stations, comprise the Virtual Observatory and Ecological Informatics System (VOIES). According to the Flathead Journal this system measures air temperature, humidity, barometric pressure, wind speed and direction, light and other meteorological parameters. The instrument, anchored above a deep water trench, also profiles temperature, dissolved oxygen, light, water clarity and algal pigments up and down the water column. 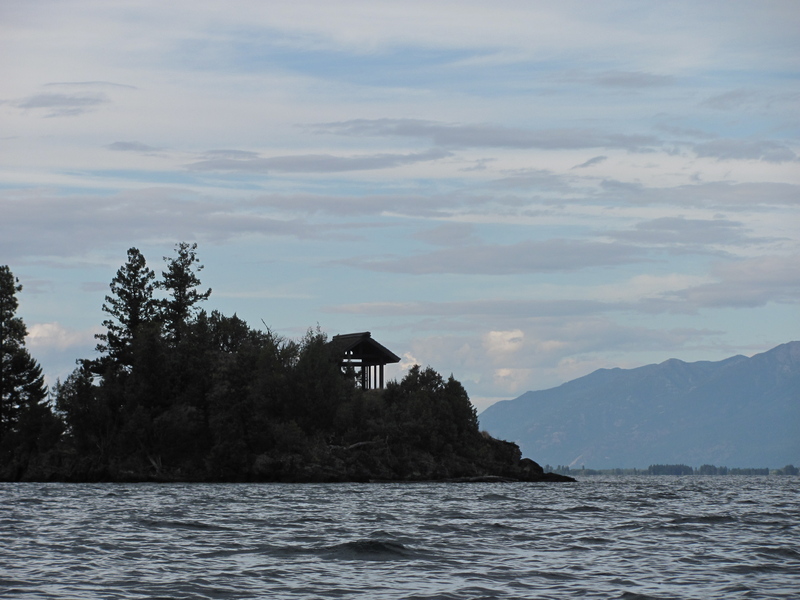 All the data is relayed back to the Flathead Lake Biological Station. The summer 2012 edition of the Journal describes what scientists have already learned from this new system. The instruments accumulate enough data to be able to predict weather and changes in water quality. In addition, Dr. Mark Lorang uses the data to develop models of water circulation and wave patterns. 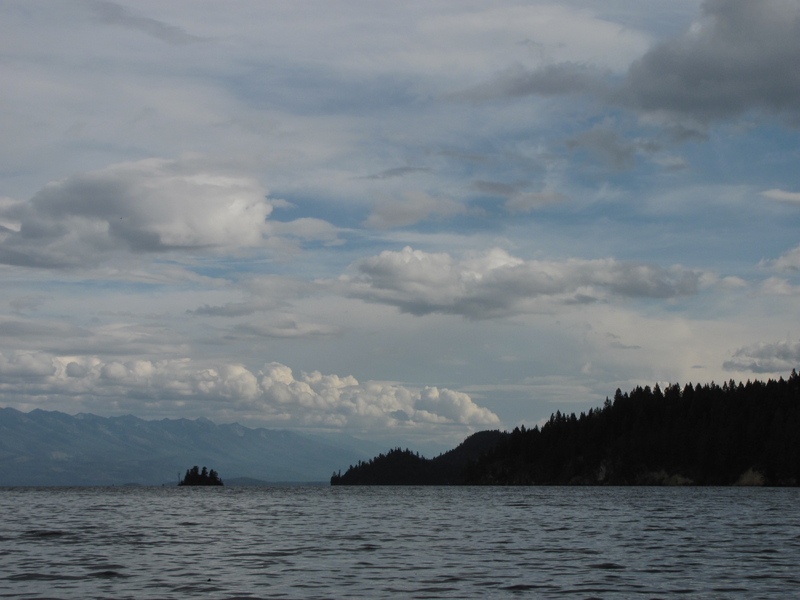 Dr. Bonnie Ellis uses the information to enhance her studies of the food web of Flathead Lake. The most immediately useful information is available to the public at http://www2.umt.edu/flbs/. Today, however, the instrument seems like a phantom floating on the water. It is strangely virtual. Pleased to have seen one of the two instruments anchored in the lake up close, I turn away and resume my paddle. I adjust my course a few degrees south, having come north to the buoy. But almost everything is guesswork. I know there is a far shore, but I see no indication of Angel Point, the meditation structure on top of the rock, no sign of the points marking the entrance to Hockaday or Hughes Bays. Every now and then I catch the faintest hint of what may be the few protruding rocks and trees of Goose Island. One moment I see the shape and the next I lose it. Trying to see this island is like looking at a star: look at it directly and it is gone; look to the side and it reappears. Far to the south I see the round gray-green shape of Cedar Island. I imagine my destination and stroke for it. Given the angle of the light, I once again feel as if I am stroking into radiance. On the return trip I settle into a slightly slower rhythm. I am not especially tired. I simply have more confidence that this labor, despite the lack of visible progress, will return me to my starting place. I trust the cumulative effect of all these strokes, that infinite gray will resolve into green and blue, red and yellow, the black of water-licked stone. After an hour or so of paddling I discern the mass of the peninsula that protects Griswold Bay, the roofline on Cummins Point, the second mass of rock that protects Hughes Bay. Stroke after stroke I become clearer that the shape I first saw faintly is indeed Goose Island, that the entrance to Deep Bay lies just north of the orange landslide barely visible through the smoke. I try not to focus on closing the distance between the dock and me. It is enough to keep Bluebird in motion and on course. Eventually I slide past a stone house I admire, snake through the teeth at the entrance to the bay, make the few last strokes across the still bay and pop the skirt. I lift Bluebird to safety for the night, change out of my booties and gather a few things I want to take up to Earth House. 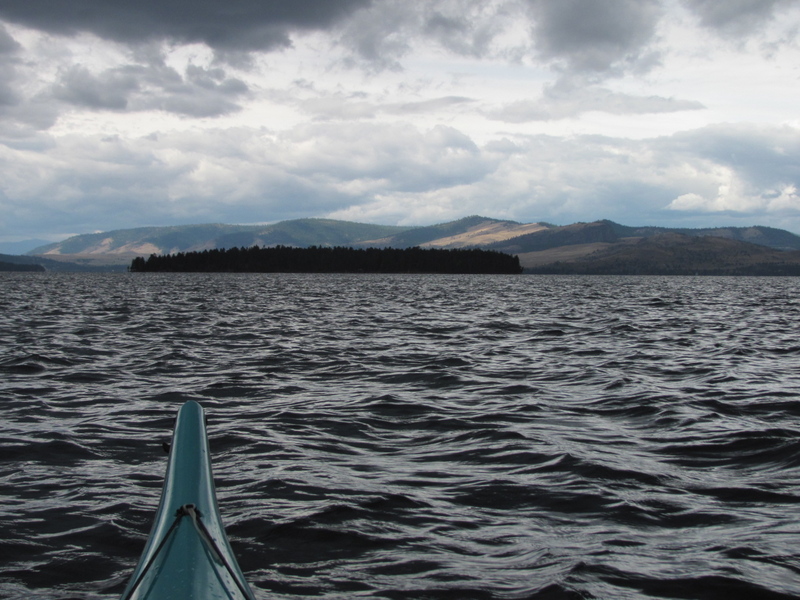 I have paddled through miles of uncertainty, leagues of guesswork, creating a triangle of about 15 miles. Hardly anything is more satisfying than paddling in the crystal clarity of late May or in October after the first few frosts. In September I fear that paddles through a smoke-filled basin will become more common as global climate change becomes more severe, as more frequent droughts and attendant fires radically change our perception of “normal.” The effects of these changes fill even the most pristine places. I hike up the trail pondering our impact on the planet. At the same time I look forward to seeing people who have waited for my return. I see another opening for a paddle. At the university I am between Galileo and Descartes and can catch my breath. The grass is too wet to mow after record-setting rains earlier in the week. I go to bed early Thursday night, planning to paddle on Friday, but feel so excited about what will almost certainly be my last paddle of the season that I wake in the middle of the night. I know that I won’t sleep unless I move, so I go outside for a view of the sky. The season’s first hard frost covers every surface with a bright glaze. Overhead, big stars and a couple of planets surround a half moon as if drawing close to their mother. With this image in my mind I return to bed for a little more sleep. In the morning I glance outside to see my kayak and truck covered with the same hard frost. The day is supposed to be as clear as the night, but I have my doubts. I tell Joyce goodbye and promise to take my cell phone as I head out the door. Heading north I see that days of rain after a frighteningly dry summer have brought raptors down to the fence lines and wires. Rough-legged and red-tail hawks scan the fields from Arlee to St. Ignatius. Up high the first snow has fallen on The Missions. The log decks at Hunts suggest they may be able to saw all winter. Atop the Polson moraine I see a lake that looks like gray fleece. I pass through town and pull into the lot at Walstad. I want to paddle around Wild Horse in a clockwise direction, visiting the places in the daylight that I explored during the night this past July. As I begin to paddle to the island I notice something I have never seen before: the horizon in every direction looks as if hundreds of geese are taking off from the surface of the water; it is as if flashing wings span the horizon. I see no birds, so I am puzzled about the cause of this apparent disturbance on the surface. Looking carefully at the horizon it appears to me as though the relatively warmer temperature of the lake in relation to still-cool morning air creates the illusion. When a distant boat passes across the horizon it seems to ride on airfoils, in the air, not the water. I like the effect. When I make the crossing to the island I usually draw near to the shore and enjoy the psychological relief that comes with seeing the bottom again. In this case I keep myself off shore and take a direct line to the flagpole snag that marks the entrance to Skeeko Bay. I pass one eagle along shore and then a second on the nearly branchless tree. I pass the big bay on my right and meet the shoreline near the island’s Primitive Area, then find my way to the beach where I rested during the darkest hours of the night. I haul out here and go for what Pooh called “an explore.” I pause over dry flowers standing stiff above the duff, find an antler shed, nearly invisible in the matted grass, a deer skull at the base of a stump, several feathers shed in the molt of August, a large ziplock baggie that I carry back as trash. The island is silent; the only sounds made by trucks gearing up the grade on the highway across the strait. After wandering I return to my boat, nestle in the gravels, and eat my lunch. 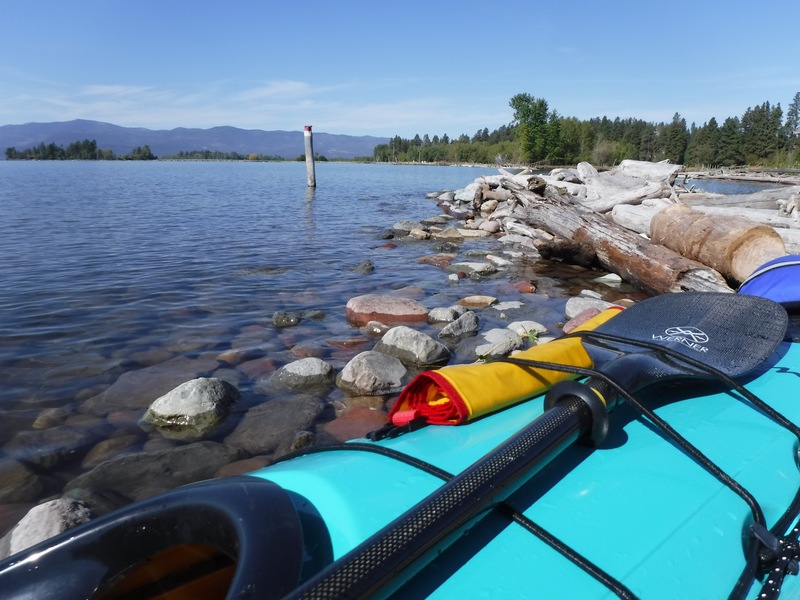 As I resume my paddle I seriously consider continuing north to Cedar Island. The crossing would add six total miles to the paddle, but I feel uncertain about the weather. Choosing caution over adventure, I continue around the island. When I reach the northernmost rocks I realize that I have made a good decision. Without having realized it until now, I have been paddling in a false calm. The island has protected me from winds blowing hard now out of the southeast. I cinch my hat to face the gusts and begin to work. By the time I reach the southeast corner of the island I realize that I need to make another decision. I had planned to follow the southern coastline of the island, traveling east to west, then cross back to Walstad. Today this would leave me with a final crossing in broadside winds and waves. I abandon this plan and head straight for the north shore of Rocky Point. I prefer a stiff headwind to taking wind and waves at oblique angles. This, too, proves to be a good decision. While the wind blows consistently from one direction the waves are utterly chaotic and disorganized. I lower the angle of my paddle, so as to keep the blades a little closer to the surface, and take the wind in the teeth. I eventually come into the relative lee created by the shoulders and ridges of the north-facing topography. 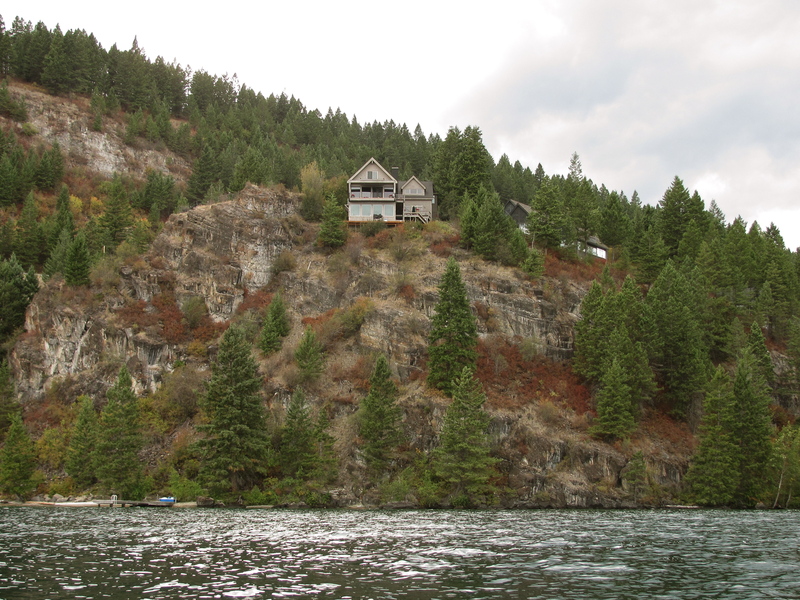 As I head west I pass Camp Marshall, an extraordinary home with a jet helicopter in the front yard, a few people hammering things down before winter or tucking their boats away. Ahead of me the water looks like abraded carbon, Melita Island black as coal. I eventually arrive at the public dock, give two boys casting lures a wide berth, and swing into the quiet little bay just beyond the access site. After putting my gear and boat away I use the high back of the bench near the dock as a windbreak and eat a huge honey crisp apple. On the way home I see even more clearly that I made good decisions today. Snow squalls veil the canyons between peaks in The Missions and rain begins to fall west of the highway near The National Bison Range. To slow the pace I take the long way around to Ravalli and increase the chance of seeing more birds. I stop several times to take photographs through the truck‘s open window. I feel drawn to all the colors of autumn grasslands, reflections in the water of Ninepipes, and rain falling near Moiese. Up ahead I see two trumpeter swans with 80-inch wingspans flying from right to left. They pass through the telephone wires, cross the road, and continue south. I check my rear view mirror to see if I can stop again. Seeing headlights, I drive on, capturing the birds in memory rather than pixels. This has been a good way to end the paddling season. I see why I woke in the middle of the night.